Menganti Beach Kebumen is the most beautiful beach in Central Java from which we have previously searched. The beauty of Menganti Beach is unequaled in central java, If you are traveling hobby, you must visit Menganti beach. Menganti Beach location is located in Karangduwur Village, District of Ayah, Kebumen Regency, Central Java. No wonder if this beach occupies the most beautiful beach position in Central Java (as well as according to wikipedia). 1. The Beauty of the Menganti Beach. Why is Menganti Beach called the Most Beautiful Beach in Central Java? Maybe I'm not so right to answer this question. However, based on my search that came directly to this beach, I see this beach really like the beauty in heaven, although I have never seen heaven before. Why do I call beaches like beauty in Heaven? this is just my shadow alone, because some of the view I see on the beach is all amazing. We will be treated to a green and cool scenery as we enter the coastal area, because this beach is located on the slopes of the hills. From the top of the hill, we can see the blue sea water and rocks. Not a few people who take advantage of this moment to have photos or selfie. Over the coastal reefs are changing. Beautiful scenery plus can be a bonus sound pyar pyur pyar, or the sound of the waves crashing into the rocks sound very clear and cool, thus creating a natural atmosphere that really natural. Of course this will make our mood so relax or feel prolonged. Moreover, if together gebetan. Selfie together on the rock, still remember that time we (me and my friends) photographs on the rock. Based on some online sources, this beach has white sand, but we do not see any white sand on the beach in, or maybe the place is very wide? so I did not find any white sand. Therefore I am not discussing the white sand on the beach. You can find out for yourself by visiting the changing beaches. Natural atmosphere is completely natural, without any vehicle noise, no pollution, the beach is spacious, quiet and clean. Beach menganti kebumen there are huts that are along the hills, in this hut we can enjoy the dishes we bring from home or snacks that we buy ourselves from the stalls there. 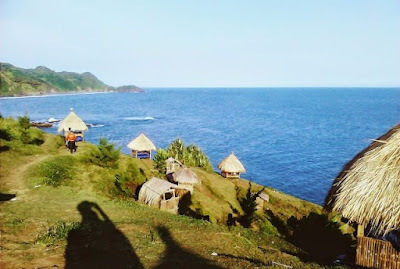 In addition to enjoying a meal or a snack, we also directly enjoy the beautiful scenery of rocks and blue sea from the hut, because this hut directly facing toward the sea. It's your choice, it's up to parking where, under or over the hill can also be important not in the sea. But by the way I do not see any cars parked here, Maybe people are reluctant to take the car because of the road to the beach to change the narrow and winding. Precisely between the parking lot and the food stall, there is a toilet and a bathroom. I do not know whether to pay or not because I did not try it. In addition there is also a clean Mushalla for you who want to worship. 3. Beach Entrance Ticket Price Change. * Cat: Prices may change at any time without our knowledge. 4. Advice Preparing To The Beach Menganti. Please note, to go to the beach menganti not as easy as to beach logending or beach suwuk equally located in kebumen. We do not recommend you use the car, because of the narrow road conditions, and winding, considering the conditions are in the hills. Then what suitable vehicle to go to the beach to change? Motor is perfect for trekking to the beach, although the road conditions are asphalted but the bends and inclines are so sharp that we recommend using the motor. At the time of the Majapahit kingdom that stood around the years 1293 to 1500 M. There is said a warlord who fled to the hills that now is the beach menganti. The commander escaped not because of war but because of his relationship with a lover who was not sanctioned by the king at the time. Who eventually escaped from the king and chose to run a relationship with his lover. Previously warlord and his lover had made a promise that they would meet in the coastal hills of Java (which is now the beach menganti) while enjoying the beautiful scenery. But the lover did not come, but the commander kept waiting for days. Well, in the ancient Javanese language, the meaning of waiting is to wait or wait. So the lively beach is taken from the story of warlord waiting for his lover. The beach was opened to the public in 2011, before this beach is not a tourist place but a place for landing the boats of the fishermen and only known by the public kebumen. 6. Beach Related to Beach Menganti. Here is the beach around the no less beautiful beach with menganti, of course the location of this beach is more easily accessible than the beach menganti. 7. Videos on the Beach are changing. When we got to the coastal hill, we made a few videos to show you that the beach is very beautiful. 8. Lack of beaches to change. The journey to the beach to change the winding because of its location in the hills. In the meantime just a review for Pantai menganti, We will update this article if deemed necessary. 2 Responses to "Menganti Beach Kebumen (Like a Hidden Paradise)"
Wah, ternyata tetangga... Terimakasih kunjungane bro.. salam sukses.